Roof Hugger Inc. is pleased to announce its acquisition by an affiliated entity of LSI Metal Building Components Group Inc. (LSI Group). Roof Hugger, based in Lutz, Fla., is the manufacturer of notched sub-purlins for retrofitting existing metal roofs. This acquisition joins Roof Hugger with LSI Group's other affiliated companies, which include Logan Stampings, LSI Metal Fabrication, and BPD (Building Products Development). 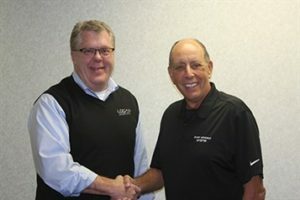 "This acquisition is a perfect advancement in the long-term plan for Roof Hugger to grow beyond our original dreams for the company", said Roof Hugger President Dale Nelson. "It creates an ideal corporate team to advance the long term goals of both entities." Roof Hugger recently celebrated its 25th year in business reaching a major milestone of having furnished retrofit sub-framing on over 75-million square feet of existing metal roofs. Accepted by most metal roofing manufacturers in the U.S., Roof Hugger's stable of products are the most tested retrofit roofing products of their kind. They are also frequently specified by Federal, State and Local governments having been installed on over 3-million square feet of U.S. military installations. Roof Hugger Inc. holds several patents, with the first being awarded in March of 1994 to inventor D.V. "Red" McConnohie. McConnohie and partner Nelson started the company in 1991. After the passing of McConnohie in 2013, Nelson assumed full ownership. Nelson will remain as President of Roof Hugger going forward. He will also continue to serve in the numerous Associations to which Roof Hugger currently belongs as well as in his current position as Chairman of the Metal Construction Association (MCA). Roof Hugger shares many common attributes with the other LSI Group affiliates including, long-term commitments to manufacturing superior products, ongoing product innovation, performance testing and the desire for customer service excellence. "We see this as a strategic move to better serve and bring value to our customer base", stated LSI Group's CEO, Robert Baker. "The acquisition of Roof Hugger supports our objective to expand into the retrofit roof and wall markets. Roof Hugger's reputation and highly recognized brand name complements our family of businesses whose products have earned the respect of the metal construction industry." Roof Hugger is a proud member of the Metal Construction Association (MCA), Metal Building Manufacturers Association (MBMA), Metal Building Contractors and Erectors Association (MBCEA), Roofing Consultants Institute (RCI) and Florida Roofing & Sheet Metal Contractors Association (FRSA).